Meghan Markle can’t “have it all” according to a royal biographer. In fact, the Duchess of Sussex is being urged to drop her Hollywood A-list lifestyle if she wants her marriage to Prince Harry to succeed. Author and royal critic Anna Pasternak, who wrote the book The Real Wallis Simpson, thinks that Meghan Markle needs to stop trying to be an international star, even though she’s now a member of the British royal family herself. 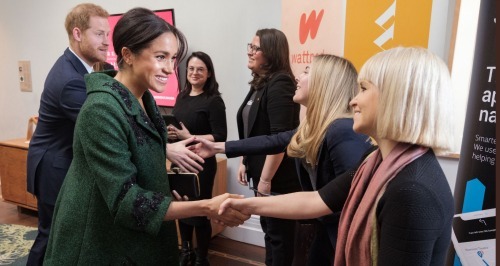 Pasternak believes that Markle would do herself a world of good if she stopped trying to chase the limelight. The Duchess of Sussex was last criticized for her over-the-top baby shower in New York City with her Hollywood friends, which included Jessica Mulroney, Serena Williams and Amal Alamuddin. Pasternak also suggested that Meghan Markle start acting more like Queen Elizabeth, Prince Charles, and even Prince William and Kate Middleton. If there is one thing that the Queen has never liked, it’s when members of the monarchy act like they belong in Hollywood more than at Buckingham Palace. So far Meghan Markle herself hasn’t made any comments about the criticism, although it is doubtful that she will. The former actress is currently pregnant with her first child and is expected to give birth sometime at the end of April. For now, don’t forget to check back with CDL for all the latest news and updates on Prince Harry, Meghan Markle and the rest of the royal family right here.